Namaste! 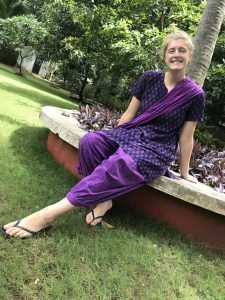 My name is Elise, I’m 22, and I am currently a volunteer at Sangam World Centre! I am in the second month of a 3.5 month placement and I am absolutely loving it. Sangam is somewhere that I always knew about, having had a Guide Leader when I was younger who would come here (and still does) every year or so. 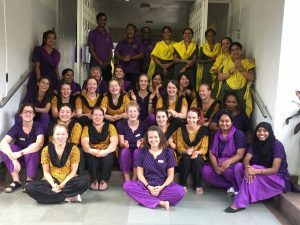 Earlier this year I completed a Bachelor of International Development at the University of Adelaide, and afterwards, I thought that volunteering at Sangam would be the perfect opportunity for me to gain some experience and skills working and living in another country. I am very passionate about community development, gendered equality, and international Guiding. 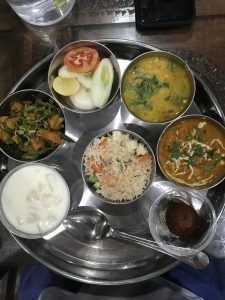 I love travel, and India is somewhere that I have always intended to go, and knowing that Sangam was here, it was an opportunity that I couldn’t pass up. I was lucky enough to travel through Nepal, Bhutan, and parts of India before starting at Sangam; something that I am very grateful for as I was able to explore the culture and way of life here myself. I was so excited before coming over here. A lot of people warned me that it would be hard; challenging to adapt to such a different culture than I was used to, but I wouldn’t have come here if I thought it was going to be easy. 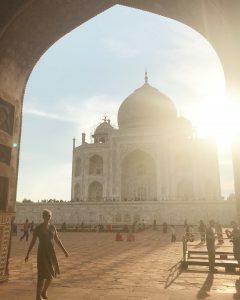 India has been so testing in so many different ways, the food, the language, the religion, the constantly being stared at – but all these things have been what has made my experience here so far unforgettable. What has also made my time here truly amazing has been the people at Sangam. We talk and make reference to our “Sangam Family” a lot, and that’s because we truly are a family here. The local Ind ian staff in our family have been more than happy to share their culture and traditions with us. Just recently, the Ganesh Festival took place here in India and we were always welcome at family homes for blessings and prayers, even just for never ending plates of food! 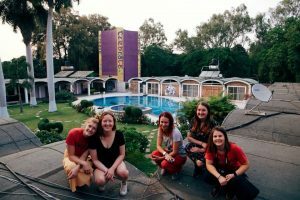 Coming over here, I wasn’t entirely sure what being a volunteer at Sangam entailed, which just meant that I came over with an open mind and a willingness to try new things. What volunteering at Sangam does mean is being able to work (and live) with the people that quickly become your best mates. Together, we run WAGGGS led initiatives like Free Being Me, Be The Change, and Stop the Violence, to Guiding participants who come from all over the world. And, as we are in India, we get to facilitate cultural sessions, like saree shopping in the city and temple exploring. My favourite part of being a volunteer however. Is getting to work with the Community Partners – something you can do full time if you apply to be a Tare at Sangam. It is a great way to interact with the people on India, rather than with our International guests, and I have already learnt a lot from it. I’ve only been here a couple of months, and I’ll still be here until the end of December, but I already don’t want to leave this amazing place filled with amazing people doing amazing things everyday! I am so grateful for this experience, and can only hope that more Girl Guides from Australia jump at this once in a lifetime opportunity! I hope to see some of you here soon!